Introduction: Surgical simulation is becoming a more widely used method in the training of residents as it enables the honing of technical skills and exposes residents to new procedures resulting in the reduction of error in the operating room and increases in patient safety. The inequities and inconsistencies of the cognitive and technical skill levels of incoming resident interns are of increasing concern. 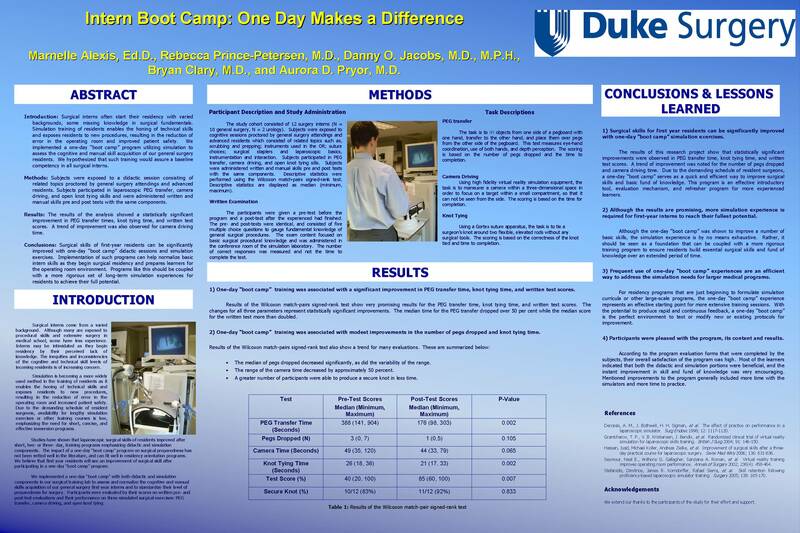 We therefore implemented a one day boot camp in our surgical skills training lab to assess the cognitive and manual skills acquisition of our general surgery first year interns and to standardize their level of preparedness for surgery. Methods: The study cohort consisted of 12 surgery interns (n=10 general surgery, n=2 urology). Subjects were exposed to a didactic session consisting of related topics proctored by general surgery attendings and advanced residents. Subjects practiced PEG transfer, camera driving and knot tying skills. Subjects were administered written and manual skills pre and post tests with the same components. Descriptive statistics are displayed as median scores and range. Comparative statistical analyses were performed using the Wilcoxon match-pairs signed-rank test. Results: The didactic training was associated with a significant improvement in PEG transfer time, knot tying time and written test scores, and a trend toward improved camera time (Table). Conclusion: A one-day didactic and practical course in the surgical skills training of interns improves manual proficiency and assures a basic fund of knowledge of residents.